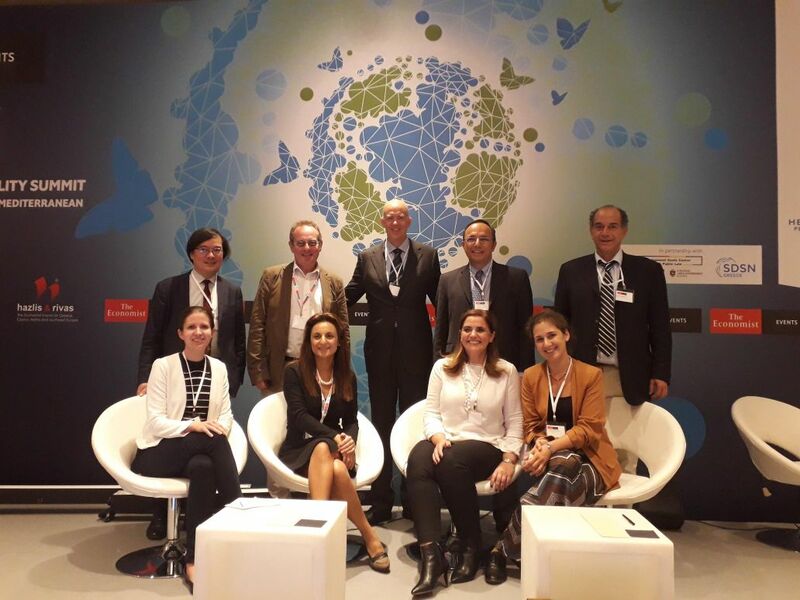 More than 400 participants, key thinkers, business leaders, policymakers, scientists, researchers, advocates and investors participated in the 2nd Sustainability Summit for South East Europe and the Mediterranean which was held on the 1st and the 2nd of October 2018, in Athens. The 2nd Sustainability Summit was organized by The Economist Events in partnership with the UN SDSN Greece, the Sustainable Development Solutions Network - a Global Initiative under the auspices of the United Nations- and the SDGs Centre for Governance and Public Law, which is jointly developed by the Cambridge University Institute for Sustainability Leadership and the European Public Law Organization. The key message was to highlight the need to build partnerships, create solutions, achieve results and promote the spirit and practice of sustainable development to civil society, the private sector and state institutions. Within this context the Summit formed the space for an open and constructive dialogue with regard to technological developments, innovative practices, scientific approaches and sustainable investments in order to pursue a new era of development and welfare. Mr. Maros Sefcovic, Vice-President of the European Commission, “Energy Union”, addressed the Summit, high lightening that transformation of the energy system in Greece could upgrade the role of the country at a European level, due to country’s climate and geographical position. Bank of Greece Governor, Mr Giannis Stournaras, stressed the fact that in the long run, value creation, depends on the capacity to adapt to climate change challenges, and the transition towards a zero-carbon economy. President of the Socialist International and Former Prime Minister of Greece, Member of the Global SDSN, Mr. George Papandreou, advanced the idea that a culture of cooperation and understanding, can lead to a more humanistic globalization and a global social contract, in order to reduce inequalities. Prof. Phoebe Koundouri, co chair of UN SDSN Greece and Director of the EIT Climate KIC Greece Hub, gave an overview of the scientific approach and demonstration projects of UN SDSN Greece, at the opening ceremony of the 2nd Sustainability Summit. She emphasized the need for a science driven, interdisciplinary and integrated approach towards the implementation of the Sustainable Development Goals of Agenda 2030. On the second day of the Sustainability Summit Prof. Koundouri advanced the message for the need to engage the relevant stakeholders for the acceleration of scientific innovation in the market, while understanding that innovative solutions for Sustainable Development need to be assessed in a long-run framework. Moderating the panel on Climate Change, Prof. Koundouri, addressed the opportunity for targeted initiatives at the entrepreneurial sector such as green shipping, blue economy and the water-food-energy nexus. The main focus areas of the 2nd Sustainability Summit were “Sustainable Development Challenges to be tackled: Global migration and Security challenges for Europe”, “Sustainability and Governance: Synergies for private and public institutions to be prepared for the challenge”, “Climate Change: Bridging the gap between innovation and investment”, “Green/Blue Islands: Sustainable tourism, biodiversity and energy”, “Circular Economy: Does it pay to do it sustainably? The positive long term impact or business, jobs and growth?”, “Sustainable and Smart Cities: Where growth can overcome obstacles and lead to prosperity”, “Green/Blue Shipping and sustainable marine resources management”, “Sustainable Finance: Green Bonds, Environmental, Social and Governance (ESG) and Social Responsible Investing (SRI)”, New Technologies and Education Facilitating the SDG’S”. The 2nd Sustainability Summit was preceeded by the official inauguration of the EIT Climate - KIC Greece Hub in an enthusiastic environment and a highly productive process. The newly established Greek Hub, will be a focal point for organizations across business and entrepreneurship, higher education and research, supporting knowledge sharing and accelerating the journey of solutions from the lab through to market. In particular, the EIT Climate-KIC Hub Greece aims to bolster a regional climate innovation movement that will initiate and catalyze strategic innovation within the society at large. This expanding movement will eventually bridge the knowledge gap in Clean Tech development between Western Europe and the South-East Mediterranean, guiding Greece towards the creation of a climate-resilient society founded on a circular, zero-carbon economy. The long-term impact will be to prevent catastrophic climate change implications through innovative climate-smart solutions. In 2018, EIT Climate-KIC Hub Greece will focus on engagement and networking activities with local actors. Raising awareness and establishing synergies will be the primary mission of the Hub. The opening remarks for the launch event were delivered by the Greek Alternate Minister of Energy and the Environment, Socrates Famellos who emphasized the importance of the Climate-KIC Greece initiative and its ambition to create a prosperous, inclusive and climate-resilient society by turning bright minds into climate innovation leaders. Prof. Phoebe Koundouri, Director EIT Climate-KIC Greece Hub (Athens University of Economics and Business, Athena RC, ICRE8, LSE, UN SDSN Greece) presented the Greek Hub and emphasized the exquisite partnership with the Academy of Athens, represented by Prof. Christos Zerefos, Uni.Fund, represented by Prof. Katerina Pramatari, ERFC represented by director Mr.Nikos Petropoulos, UN SDSN Greece, represented by the co-Chair, Prof. Andreas Papandreou, IOBE (Foundation for Economic and Industrial Research) represented by the director Prof. Nikos Vettas and Eunice Energy Group, represented by the director Mr. Zissimos Mantas. A panel discussion session under the title “Empowering Synergies” followed, with the participation of Directors from European EIT Climate-KIC Hubs, Dr. Alexandros Charalambides representing EIT Climate-KIC Hub Cyprus, Ms. Mariyana Hamanova representing EIT Climate-KIC Hub Bulgaria and Mr. Gonçalo Amorim, representing EIT Climate-KIC Hub Portugal, three impact hubs (ACEin, Chrysalis LEAP, The People’s Trust ) and greek start-ups and from abroad, (Innoetics, Cyclefi, BRIGAID, Illumimatrix, Helbio Hydrogen & Energy Systems, Centaur, Alchemia Nova GmbH, CER, Community Energy River, BIO2CHP), and the four Greek EIT KIC Hubs (EIT Raw Materials: Dr. Anna Gaki; EIT Digital: Mr. Filippos Zakopoulos; EIT Inno Energy: Mr. Paris Rallis; EIT Health: Mr. George Megas). The launch event concluded with the presentation of Athens Climathon 2018 which will be held on the 26th of October 2018, while the Minister of Foreign Affairs, George Katrougalos concluded the launch by highlighted the need for green start-up initiatives in order to strengthen the capacity of innovation ecosystems within Greece and the Southeast Mediterranean region.